Positioning finances to ensure that paying for college doesn't wreck other plans was a challenge for my family. When my children were babies, I started strong, setting aside money in minor accounts even before the advent of 529 plans. But the day-to-day activities of raising children often distracted me from longer range planning. As a result, there's a shortfall between our savings designated for college and our college bills. With teenagers in the house, gallons of milk and orange juice, dinner leftovers designated for lunch, frozen bananas and other supplies for pre- and post-workout smoothies, healthy snacks, and those only-after-a-100K-bike-ride treats (chocolate-covered gelato bars, I'm looking at you) disappeared without a trace. In addition, my kids often ate out with friends or grabbed meals from quick-serve restaurants on their travels to and from school, work, and practices. Today, my college-aged kids eat at university dining halls and consume home-prepped snacks, instead of spending on restaurant meals with high school or college friends. In addition, back at home, dinner out with the family (just the two of us) is much cheaper as we're paying for fewer meals.Meals (aka “board”) are typically included in the cost of attendance. So, even though we are still paying for food, this expense is categorized as a college cost. Plus, now that these costs are more visible to our students, they are more thrifty with their food budgets. As a result of changes in our grocery buying and dining habits, my husband and I are spending less. Monthly cost savings in this category is about $350 — close to USDA estimates relating to the cost of feeding teenage boys. When I was in high school, I went on one big trip: a two-week cycling trip on the Blue Ridge Parkway followed by a week at a Young Life camp in the mountains. I'm glad I participated because the fitness training for the trip yielded a life-long interest in running and cycling. Trip costs ranged from about $500 to $3,000. Expenses were incurred not only for travel, lodging, and food but also incidentals like backpacking gear and special vaccinations. Fundraisers helped defray some of the costs but didn't erase entire bills. Now that those trips are over, we've found ourselves with an extra $100 each month. My teenagers consumed a lot of energy in our house. They washed and dried lots of clothes and towels. They dirtied cups and dishes, which then required cleaning. One of them took long, hot showers. Further, they sometimes liked HVAC temperature settings that were cooler in the summer and warmer in the winter than I preferred.With the kids away at college (along with improvements in energy efficiency), we're enjoying lower bills for electricity, natural gas, and water. The amount varies monthly but we're saving approximately $20 per month. When my kids were in middle school and high school, I often bought them video games and sports equipment for their birthdays and special occasions. Now that they're in college, these items aren't useful to them. They still want and need clothes but pricey wants have fallen on their priority lists. I'm saving an average of $25 monthly by not spending on kid's hobbies and activities. My kids attended public schools but extras weren't free. In any given year, we paid for school portraits, yearbooks, parking fees, graduation fees, college application fees, and college-prep materials like SAT, SAT Subject, ACT, and AP tests. In addition, we paid to buy tickets to their ballgames and band concerts. As a parent, I wanted to make sure my kids had what they needed for a successful high school career, which I believed could help them in college and later in life. Today, my college-aged kids sort through what is a necessary expense and what is nice to have, and make sensible and generally frugal spending decisions without my input. Not having to spend on day-to-day and seasonal expenses saves us about $40 monthly. Now that both kids are in college, we're saving more than $500 each month or $6,000 per year. That's not enough to foot the tuition, fees, room, and board at most colleges. But savings at home help offset costs associated with sending them to school. This approach isn't the perfect way to plan when contemplating paying for college. It wouldn't work well for us if we didn't have current income and investments. But it's been a practical solution that complements drawing down the kids' college savings accounts. 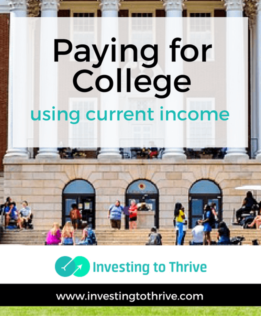 Have you paid for college using current income?